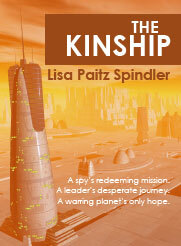 I recently joined Authonomy, a community/social networking site “for writers, readers and publishers, conceived and developed by book editors at HarperCollins.” The first four chapters of my book THE KINSHIP is now available on Authonomy, so if you’ve been the least bit curious please go check it out. If you like it — and I hope you do — please back my book by adding it to your bookshelf. This will raise the book’s rank and increase my chances of garnering an editorial review. “You know weâ€™re breaking mission protocol.” Lieutenant Jana Randall yanked up her sleeves. Tang of alcohol, stab of a needle in each arm. The medtech at the rundown clinic hooked Jana to the cell separator that would remove the microscopic markers from her blood, tools the Kinship used to track its agents. The Domek Cartel sold weapons and drugs all over the quadrant. She had been working with Rodrik to infiltrate the organization for months. Jana nodded. If they closed the deal and secured the information on the cartel’s trading routes, then the Kinship could shut down Domek in the whole sector. “You can re-inject when this is over. Enjoy the freedom for a change.” Rodrik smiled and kissed her, a quick slip of tongue over lip laced with a note of ginger from their last meal. She never could say no to Rodrik.